John Eric Hillman was born on April 27th 1966 in Gary, Indiana. 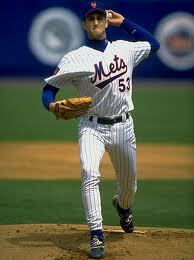 The tall six foot ten left hander was drafted by the New York Mets in the 16th round of the 1987 draft. He pitched in the minors for six years, going a best 9-2 with a 3.65 ERA leading the AAA Tidewater Tides staff in 1992. That season he was called up to the Mets on two separate occasions, making his MLB debut in San Diego on May 18th pitching one inning of relief of Dwight Gooden. On August 11th he pitched eight innings of shutout ball, beating the Pittsburgh Pirates 2-0 at Shea Stadium earning his first win. In his next start he went into the 9th inning earning a win at San Francisco beating the Giants 5-3. He would finish the year at 2-2 taking two losses at the end of September where he allowed eleven earned runs in just four innings of work. That season he was the tallest pitcher in the big leagues along with Randy Johnson of the Seattle Mariners. 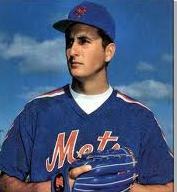 Hillman returned to the Mets in May of 1993 and was greeted to a loss to the St. Louis Cardinals. He started out 0-4 pitching in both a relief & starting role. His best outing came on July 25th when he pitched a five hit shutout at Los Angles to beat the Dodgers for his first win. He would lose his next five decisions & not earn another win until September 30th his final game of the year. In that game he pitched a complete game one run ten hit performance against the Cardinals at Shea Stadium. He finished the year at 2-9 with a 3.79 ERA in 27 appearances. In 1994 he started out the year with Mets but quickly fell to 0-3 with a 7.79 ERA after allowing nine HRs in just eleven innings pitched. He was sent down to AAA Norfolk & went 10-1 there with a 2.86 ERA. Hillman went on to pitch for the Chiba Lotte Marines IN 1995, pitching for manager Bobby Valentine in Japan. He went 14-9 making the All Star team winning the games MVP Award. That season he was voted to the Best Nine team. 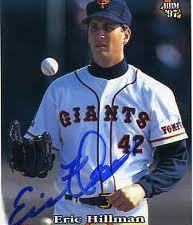 In 1997 the Yomiuri Giants purchased his contract but he only pitched six innings due to a torn rotator cuff. He attempted to come back to pitch in the US but retired officially by 2000. In his three year career he was 4-14 with a 4.85 ERA, striking out 96 batters walking 45 while allowing 30 HRs in 232 innings pitched in 49 appearances. After his playing days he went on to work as an analyst for FSN with the Colorado Rockies (2005-2008).